Everything you need to harvest and process your big crop! Harvesting is the most critical stage and what you've been working towards for months and months. These tools will help you protect your precious fruits and flowers and extract every last bit of essential oil from them as well as maintain superior quality through the drying process. Secret Jardin DryIT 90, 5 Layer Dryer, 31"
Best of all, Goldleaf has a full-time staff ready to assist you with the installation of all these components! When you purchase any Goldleaf Hydroponics complete kit or combo package through Amazon, you also get a free lifetime Frequent Farmer Gold (FFG) membership card entitling you to 10% off all regularly priced items when purchased direct. What does this mean? It means not only do you never pay full retail price again but you have access to unlimited free garden support from Monday-Saturday 10-7 EST by calling our national hotline at 812-500-0423. We are real people that have extensively tested all the products we sell, and we are eager to share our knowledge with you. We can actually help you grow better! Additionally, Goldleaf Hydroponics is able to facilitate warranties and repair items in-house. This means you'll never get the runaround and will have warranties honored long after your purchase. We will literally walk you through every step of the process from how to take a clone to deciding when to harvest. 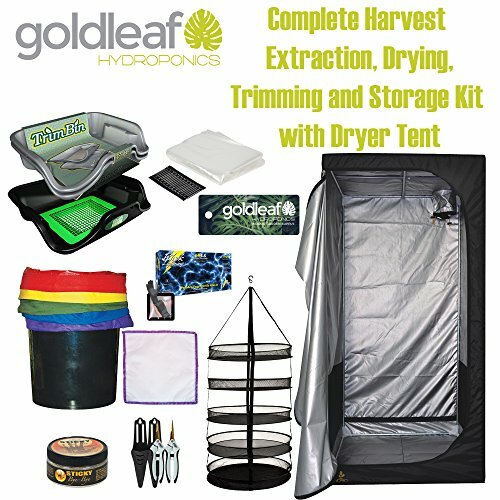 Grow gold with Goldleaf complete kits! Thanks for checking out Goldleaf Hydroponics custom kits. Happy growing! Make sure to purchase with Goldleaf Hydroponics to insure you get EXACTLY what you see here and for warranty Support Long After Purchase!! Everything you need to harvest and process your big crop! Harvesting is the most critical stage and what you've been working towards for months and months. These tools will help you protect your precious fruits and flowers and extract every last bit of essential oil from them as well as maintain superior quality through the drying process. If you have any questions about this product by Goldleaf Hydroponics, contact us by completing and submitting the form below. If you are looking for a specif part number, please include it with your message.